Electric oil pump is made of 3 phase asynchronous motor, low pressure oil pump, high pressure oil pump and oil box. Small dimension, high pressure, light weight, simple structure, and it has a spare joint for connecting oil gauge. If the oil pump is matched with other hydraulic tool, it can supply driven for lifting, profiling, bending pipe, straightening, tearing down, cutting, installing, gauging pipe, punching and etc. It can reduce labour strength and increase working efficiency. GBD series of ultrahigh pressure single acting electric oil pump is single outlet, high-low pressure pump, parallel type hydraulic power pack, high-low pressure pump supply oil at the same time when low pressure, it can get the large output flow; low pressure pump automatically unloading back the oil via control valve when high pressure, it can reduce the consumption of electric motor and heat of oil, it has the function of stop machine to protect pressure, single oil-way backing oil and etc. 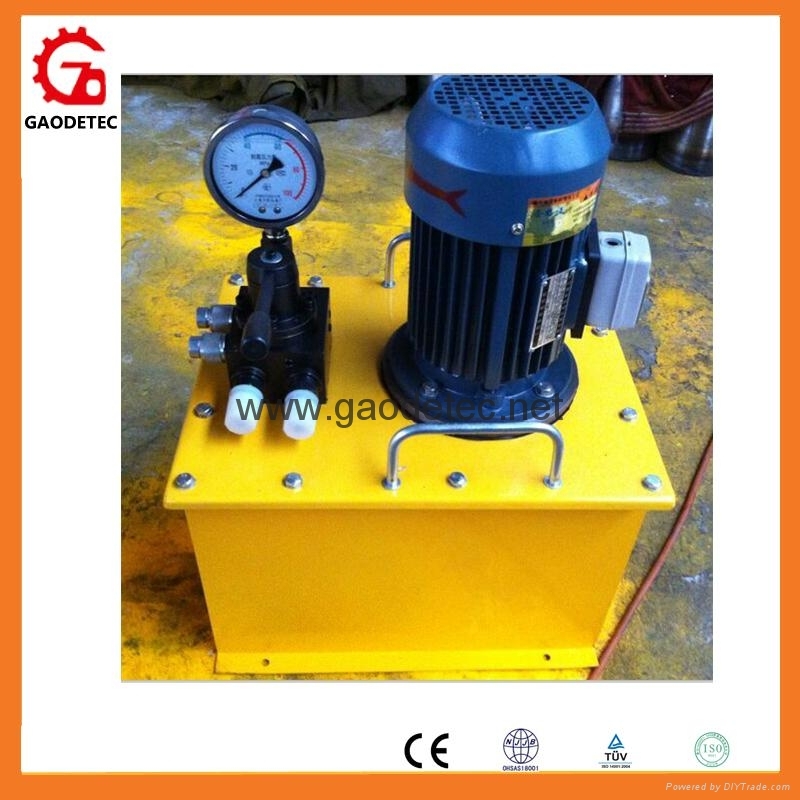 This ultrahigh pressure double acting electric oil pump is a complete hydraulic power pack, it is made of oil pump, control valve, oil box, motor, oil gauge and etc. 1) small dimension, light weight, convenient usage, high working pressure. 2) Single stage pump station: simple structure, it can get higher working pressure. 3) Double stage pump station: high-low pressure pump supply oil at the same time when low pressure, it can get the large output flow; low pressure pump automatically unloading back the oil via control valve when high pressure, it can reduce the consumption of electric motor. 4) holding function: at the condition that outer oil-way is no reveal, stop the pump for holding 5 minters, rated pressure reduce less than 5Mpa. 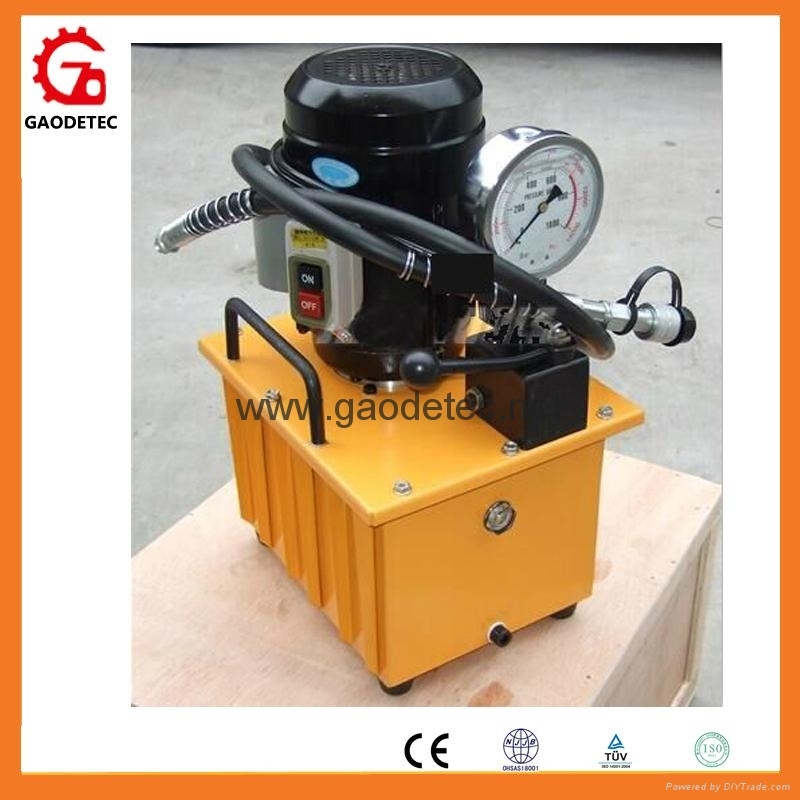 1) the oil pump is matched with other hydraulic tool, it can supply driven for lifting, profiling, bending pipe, straightening, tearing down, cutting, installing, gauging pipe, punching and etc. 2) It also can be installed into some machine for supplying power pack. 3) As test pressure pump station for kinds of high pressure hydraulic component, high pressure container, high pressure rubber hose.